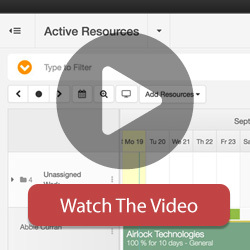 The Hub Planner Scheduler is the most powerful component in the software and is core to all scheduling operations. The bookings grid (Scheduler) should give you a bird’s eye view of your resources visually so you can gain valuable insight into who has availability, who is working on projects, who is sick or on vacation and essentially how efficient your business is running. The scheduler bookings grid can be compared to a mashup between a spreadsheet and a calendar. It is comprised of a horizontal date line which can be scaled (zoomed) and a vertical list of resources which can be booked. This structure is what makes up the cells of the grid and is the main interactive component for booking and scheduling your team. We take usability and design very seriously at Hub Planner, and that is echoed in details throughout the entire platform. The bookings grid should feel ‘application-like’ and you should experience similar usability & performance in your Hub Planner business scheduling tool as you would expect in your personal tools. The main scheduler grid can be controlled by a number of ways, with the most common ways to drag, drop, select and use the tools menu to add and control the content on your grid. This is described in more detail in the Adding / Editing section. Perfect For: The Scheduler bookings grid is perfect for those Monday Morning Meetings or Friday Evening wrap ups to see how the week ahead looks and how the current week went. Everyone can easily digest where the gaps are in production within a few glances at the schedule.